The posterior pituitary (or neurohypophysis) is the posterior lobe of the pituitary gland which is part of the endocrine system. The posterior pituitary is not glandular as is the anterior pituitary. Instead, it is largely a collection of axonal projections from the hypothalamus that terminate behind the anterior pituitary, and serve as a site for the secretion of neurohypophysial hormones (oxytocin and vasopressin) directly into the blood. The hypothalamic–neurohypophyseal system is composed of the hypothalamus (the paraventricular nucleus and supraoptic nucleus), posterior pituitary, and these axonal projections. Pituitary gland. Posterior pituitary is in blue and Anterior pituitary is in orange. Pars nervosa and infundibular stalk are not labeled, but pars nervosa is at bottom and infundibular stalk is at top. The posterior pituitary consists mainly of neuronal projections (axons) of magnocellular neurosecretory cells extending from the supraoptic and paraventricular nuclei of the hypothalamus. These axons store and release neurohypophysial hormones oxytocin and vasopressin into the neurohypophyseal capillaries, from there they get into the systemic circulation (and partly back into the hypophyseal portal system). In addition to axons, the posterior pituitary also contains pituicytes, specialized glial cells resembling astrocytes assisting in the storage and release of the hormones. Also called the neural lobe or posterior lobe, this region constitutes the majority of the posterior pituitary and is the storage site of oxytocin and vasopressin. Sometimes (incorrectly) considered synonymous with the posterior pituitary, the pars nervosa includes Herring bodies and pituicytes. Also known as the infundibulum or pituitary stalk, the infundibular stalk bridges the hypothalamic and hypophyseal systems. The median eminence is only occasionally included as part of the posterior pituitary. Other sources specifically exclude it from the pituitary. A few sources include the pars intermedia as part of the posterior lobe, but this is a minority view. 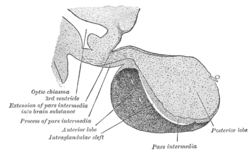 It is based upon the gross anatomical separation of the posterior and anterior pituitary along the cystic remnants of Rathke's pouch, causing the pars intermedia to remain attached to the neurohypophysis. Two hormones are classically considered as being related to the posterior pituitary: oxytocin and vasopressin. These hormones are created in the hypothalamus and released in the posterior pituitary. After creation, they are stored in neurosecretory vesicles regrouped into Herring bodies before being secreted in the posterior pituitary via the bloodstream. Insufficient secretion of vasopressin underlies diabetes insipidus, a condition in which the body loses the capacity to concentrate urine. Affected individuals excrete as much as 20 liters of dilute urine per day. Oversecretion of vasopressin causes the syndrome of inappropriate antidiuretic hormone (SIADH). ^ a b Malenka RC, Nestler EJ, Hyman SE (2009). "Chapter 10: Neural and Neuroendocrine Control of the Internal Milieu". In Sydor A, Brown RY (ed.). Molecular Neuropharmacology: A Foundation for Clinical Neuroscience (2nd ed.). New York: McGraw-Hill Medical. pp. 246, 248–259. ISBN 9780071481274. ^ Hatton, GI (September 1988). "Pituicytes, glia and control of terminal secretion" (PDF). The Journal of Experimental Biology. 139: 67–79. PMID 3062122. ^ Histology image:14004loa from Vaughan, Deborah (2002). A Learning System in Histology: CD-ROM and Guide. Oxford University Press. ISBN 978-0195151732.